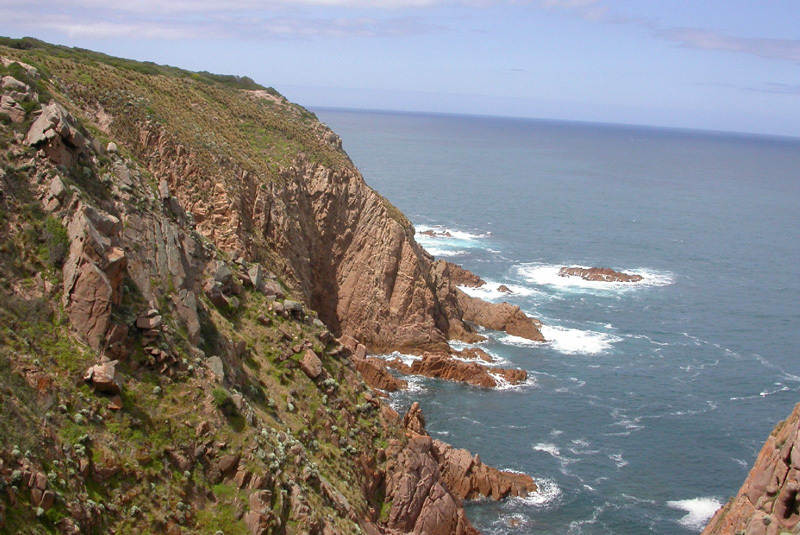 Cape Woolamai is a wild place of rugged, windswept cliffs, seabirds and crashing surf. It is a granite promontory sticking out from Phillip Island into Bass Straight and as such it bears the brunt of the weather. 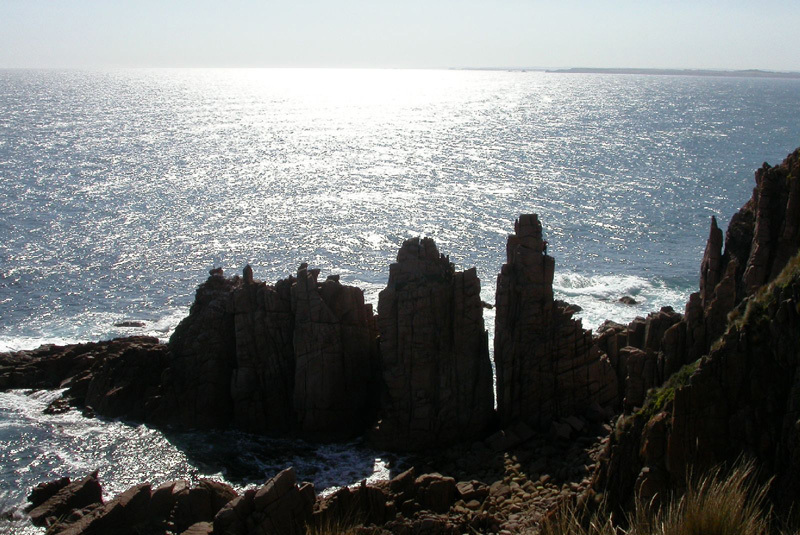 The rock is coarse-grained granite with colours ranging from grey and orange through to a deep rusty red. Be warned however, this place is not for the inexperienced or the faint hearted. The cliffs are decaying and the climbs on them are generally serious and intimidating. Much of the rock resembles used kitty litter and the fixed protection is either long gone or rusted beyond hope. You will clip it anyway. All that said the place has a fantastic atmosphere with some good climbs in spectacular positions. 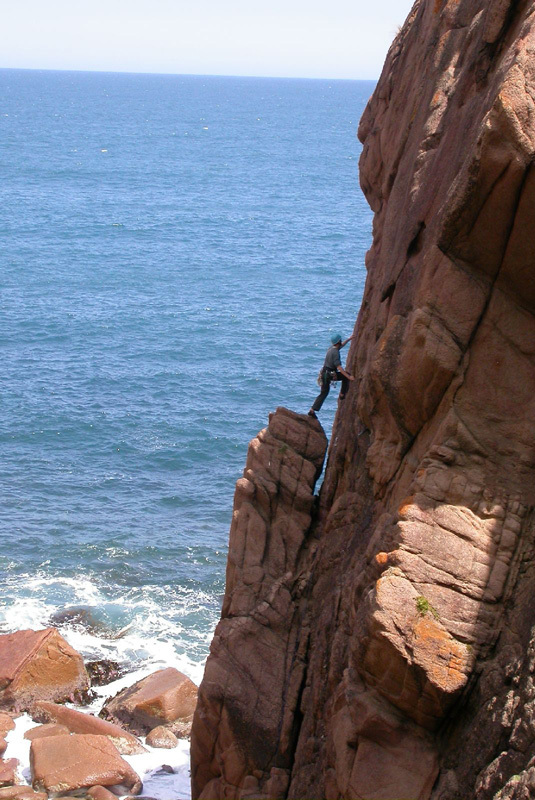 There is something really exhilarating about climbing near the sea and as the Eastern Victoria guide suggests “Climb here and you will realise its attraction.”. Drive to Phillip Island – Allow about 1.5 hours from Melbourne - follow the signs down the Bass Highway and cross the bridge onto the island. After about 2km turn left onto Woolamai Beach Road. Follow this all the way to the big car park by the beach. There are toilets at the surf lifesaving club. Pulpit Rock is the obvious big rock visible out on the point to your left. Walk east along the beach for about 1km until you can climb up some wooden stairs back onto the dunes. You can also continue along the beach if the tide is low. Follow the walking track around the coast until you reach a wooden seat. From here you get a good view of The Pinnacle Traverse (5). An easy scramble will get you down to climbs on Pulpit Rock. The climbing here is broken up into a couple of main areas, Pulpit Rock Area (including the Pinnacles), Middle Coast Area, The Big Cliff (which is probably the most frequently visited of the areas here), Pirate Pete Cove, and the Red Rock Area. Access generally involves a scramble down a steep hillside, but it pays to know where to head down. Grab a copy of the VCC’s Eastern Victoria guide which will give you more detail on finding climbs. Above Right: Jeff Triplett leading Matelot (11). Below Right: Geoff Brian (?) on Poseidon (15). Bottom: A late afternoon view of The Pinnacle Traverse (5). All Photos by Tony Brotherton. Helmets are a very good idea. You can pretty-much leave all your small wires behind and just bring middle and large-sized wires and lots and lots of cams. Don’t forget to wash all your gear after the trip as salt water and sea spray will get into everything. There is a great circuit walk round past the lighthouse if you get there and the weather is bad. This will take you past all the climbing areas and give you an idea of the remote feel of the place. The surfing and swimming at Woolamai beach are great and the walk back along the beach after a day on the cliffs is fantastic..
Eastern Victoria - A rock climbing guide, edited by Michael Hampton, Robin Holmes, Paul Martin & Others, and available from local climbing shops, or the VCC.